But we must not just think that the Protestant Ethic was only a factor for entrepreneurs. The idea of the calling and of work for its sake alone went down to the lowest levels of employment. It was this essentially Protestant attitude that was in short supply in the Austrian Empire. If the worker does not believe in the innate value of work there are only limited and inefficient ways of encouraging economic activity. Weber points out that the intuitive methods of economic management can produce just the opposite effects. If, for example, in order to increase productivity by motivating workers on piece rates the employer increases the unit rate, workers do not necessarily respond by producing more in order to earn more, they often work less hard and so produce less in order to earn just the same as before. On the other hand, paying poverty wages to extract increased production is also ineffective: starved workers have low productivity and are unsuitable for any skilled labour or the operation of complex machinery. The average Silesian of today [c. 1900] mows with full effort only a little more than two thirds as much land in the same time as the better paid and fed Pomeranian or Mecklenburger. The physical effort of the Pole declines in comparison with the German the further east he comes from. Weber gives an example of the particular difficulty of employing women in Catholic societies. Women of the third estate in the Austrian Empire had a minimal education, just enough for menial labour. According to Weber, it was very difficult to get women to leave tradition behind and adapt to new ways of working. 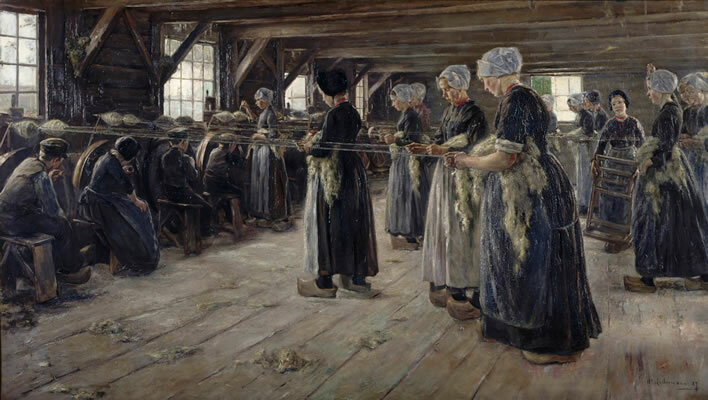 Max Liebermann (1847–1935), Flachsscheuer in Laren, 'The Flax Barn in Laren' (1887). Image: Alte Nationalgalerie. Not Austria, but the Netherlands. A half industrialised process, but at least communal work as opposed to the cottage industry production of flax that collapsed in the 1840s, leading to the Silesian Weavers' Uprising in 1844. On that occasion, the income of the weavers had been pushed down below starvation levels by competition from the mechanised weaving introduced in industrialised countries, leaving them with a stark choice between starving to death or being shot to death. 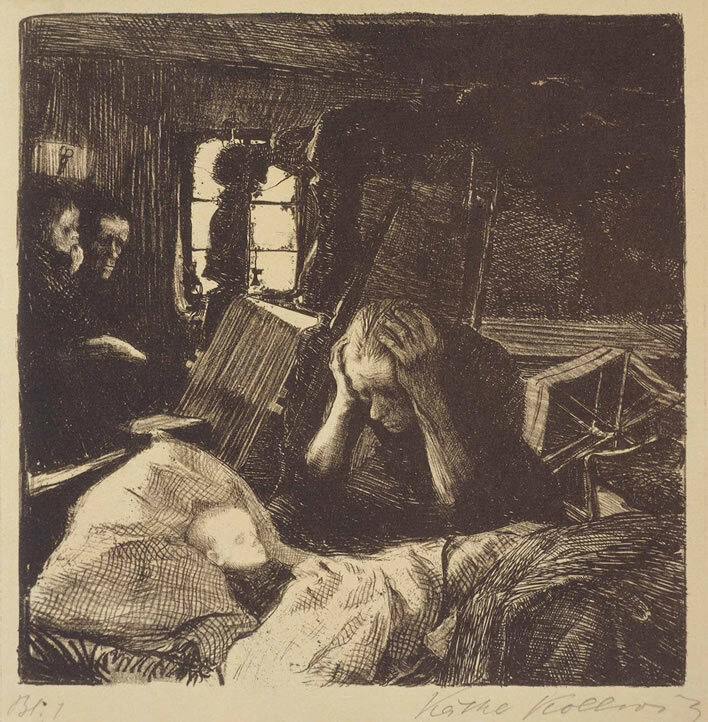 The first image of Käthe Kollwitz's cycle Der Weberaufstand, 'The Weavers' Uprising', drawn in 1897. An example of the backward, traditional view of work is to be found frequently among female workers, especially unmarried ones. In particular their complete inability and unwillingness to abandon traditional or previously learned ways of working in favour of other, more practical ways, or to adapt to new forms of working, or to learn and concentrate or even just to use their brains is an almost general complaint of employers who employ girls, particularly German girls. Discussions about the possibility of making the work easier – above all more profitable – normally result in complete incomprehension, the idea of increasing the piece rate just shatters on the wall of old habits. It is often said, and occasional statistical investigations confirm it, that this category [of women, girls from Puritan homes] has the best chance of economic education. The ability to concentrate as well as the the possession of the absolutely critical attitude of obligation to one's job are found to be combined with a strict personal economy that calculates on the basis of the level of income as well as with a sober self-control and frugality which increase performance exceptionally. The soil that capitalism requires for the understanding of the value of work for itself – as a 'calling' – is most fertile here and because of religious education the chance of overcoming the traditional easy-going stroll through life the greatest. That is the undying service of Protestantism, to have released people from the chains of the Church, made them rely upon themselves instead and replaced a human authority with a divine authority. Der heutige durchschnittliche Schlesier mäht bei voller Anstrengung wenig mehr als zwei Drittel soviel Land in der gleichen Zeit wie der besser Belohnte und genährte Pommer oder Mecklenburger, der Pole leistet physisch, je weiter östlich er her ist, desto weniger im Vergleich zum Deutschen. Ein Bild rückständiger traditionalistischer Form der Arbeit bieten heute besonders oft die Arbeiterinnen, besonders die unverheirateten. Insbesondere ihr absoluter Mangel an Fähigkeit und Willigkeit, überkommene und einmal erlernte Arten des Arbeitens zugunsten anderer, praktischerer, aufzugeben, sich neuen Arbeitsformen anzupassen, zu lernen und den Verstand zu konzentrieren oder nur überhaupt zu brauchen, ist eine fast allgemeine Klage von Arbeitgebern, die Mädchen, zumal deutsche Mädchen, beschäftigen. Auseinandersetzungen über die Möglichkeit, sich die Arbeit leichter, vor allem einträglicher, zu gestalten, pflegen bei ihnen auf völliges Unverständnis zu stoßen, Erhöhung der Akkordsätze prallt wirkungslos an der Mauer der Gewöhnung ab. Man kann es oft hören, und gelegentliche rechnerische Nachprüfungen bestätigen es, daß weitaus die günstigsten Chancen wirtschaftlicher Erziehung sich bei dieser Kategorie [Mädchen pietistischer Provenienz] eröffnen. Die Fähigkeit der Konzentration der Gedanken sowohl als die absolut zentrale Haltung: sich “der Arbeit gegenüber verpflichtet” zu führen, finden sich hier besonders oft vereinigt mit strenger Wirtschaftlichkeit, die mit dem Verdienst und seiner Höhe überhaupt rechnet und mit einer nüchternen Selbstbeherrschung und Mäßigkeit, welche die Leistungsfähigkeit ungemein steigert. Der Boden für jene Auffassung der Arbeit als Selbstzweck, als 'Beruf', wie sie der Kapitalismus fordert, ist hier am günstigsten, die Chance, den traditionalistischen Schlendrian zu überwinden, infolge der religiösen Erziehung am größten. 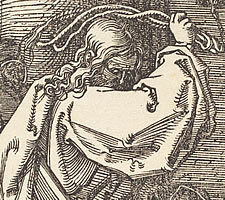 ^ Adolf Glassbrenner, Bilder und Träume aus Wien, Wien : Rikola-Verlag, 1922, p. 191. Das ist das unsterbliche Verdienst des Protestantismus, den Menschen aus den Fesseln der Kirche erlöst, ihn auf sich selbst hingewiesen zu haben, an die Stelle einer menschlichen Autorität die göttliche zu setzen.